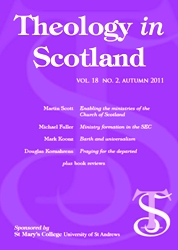 Theology in Scotland is a journal of theology which is general in scope, but which is rooted in the Scottish theological tradition. Founded in 1994, the journal is published in print and online twice a year, in spring and autumn. The journal publishes articles and book reviews from authors from across the theological spectrum, and particularly welcomes submissions which focus on aspects of Scottish theology. To date, these have included: studies of the work of prominent Scottish theologians; responses to current issues in the Scottish church and nation; and aspects of Scottish church history.